Plan A Day At This Gurgaon Spot That Has Boats, Trains & Hammocks! NeverEnuf Garden Railway in Gurgaon is a beautiful space with miniature train sets, remote controlled boats and cars, and ample green space to walk around having chai. 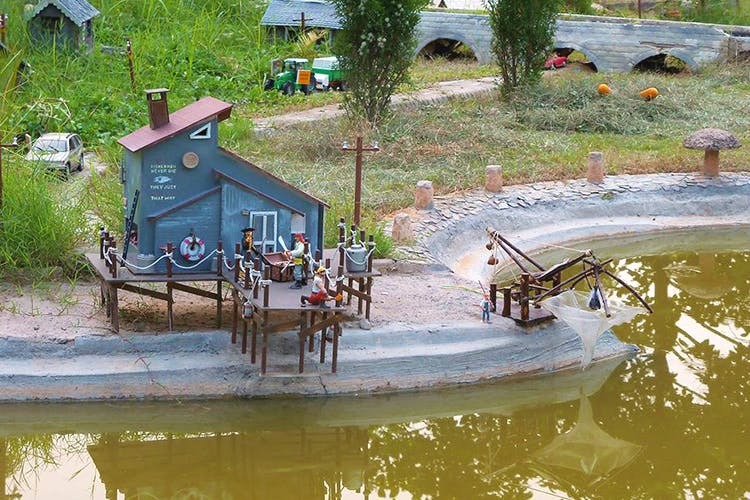 The owner of NeverEnuf, Adesh, is a gifted train-modelling enthusiast who has installed his creations in a Lilliputian world straight out of a picture book. There are miniature trains trudging along bridges, going around hills, passing lazy brooks and navigating cake-sized houses. Not only is this a refreshing change from the done-to-death Lodhi garden and maddening amusement parks, it allows everyone to acquaint themselves with a new hobby – rail-modelling. And no one’s ever too old to embrace a new hobby, right? Just ahead of Manesar, this is just the place for you if you’re hoping to unwind while also letting your children have a good, learning-as-they-play kind of time. In fact, the board games, painting easels and activity sheets are going to take care of most of their creative energy. And, unless you assume otherwise, smart kids aren’t a prerequisite to enjoying this gem. Feel free to make your geeky bae tag along if you’d like him to relive fond childhood memories of stunning model trains, or automobiles emitting a tiny cloud of smoke or lighting up at the click of a button. Don’t forget to pre-register so the hospitable hosts know when to expect you. The facility is only open on the weekends–Saturdays and Sundays–so make sure you plan accordingly. The entry fee is INR 550 (all inclusive) for children above two, and includes hot and cold beverages, use of all in-house facilities, a DIY kit to take back home and activity sheets. All you have to do? Pack a picnic basket with marmalade, crackers, chips and curiosity. PS: Don’t forget to Instagram every inch of this beauty.